Timed to coincide with the 53rd anniversary of Rev. 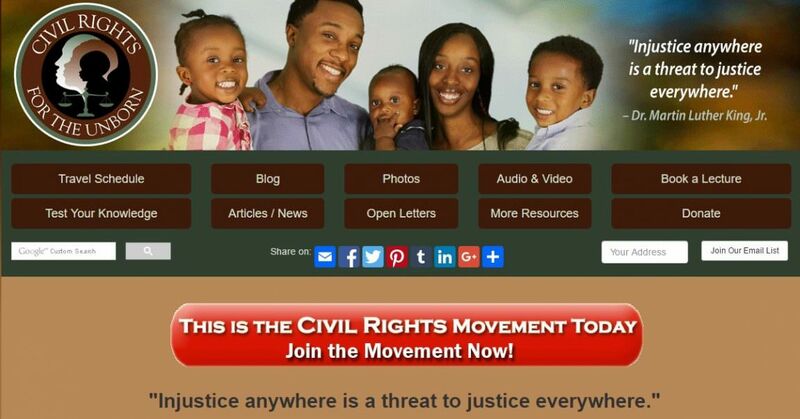 Martin Luther King’s “I Have a Dream” speech, Priests for Life’s African-American Outreach is launching a new website, logo, mascot and name–Civil Rights for the Unborn (CRU)-for the ministry led by MLK’s niece. “We interrupt our announcement of unveiling our new “Civil Rights for the Unborn” website to report another death from a Planned Parenthood abortion, says Dr. Alveda King. “Mounting grief over yet more abortion deaths – this time of Michigan mother Cree Erwin and baby-overshadows our news. Black leaders and prolife leaders at large are outraged and grieved that yet another young beautiful Black woman and her baby have recently succumbed to painful deaths following an abortion at a Planned Parenthood facility,” explains King. In the aftermath of Ms. Erwin’s abortion death, one of many in America, Pastor Clennard Childress, cofounder of L.E.A.R.N. says: “Black Life Matters has [recently] teamed up with the most destructive racist machine in American history; its founder, Margaret Sanger was the most devout racist of her time! The leading killer of innocent unarmed African Americans in the womb – whose hands were up, but given no choice or chance at the American Dream their fellow African American, Dr. Martin Luther King preached about–is Planned Parenthood! “It breaks my heart that when a young man is gunned down by a [police officer], the media runs with it like wildfire. Yet, if an abortionist kills a young black woman and baby, the silence is tragic,” adds Dr. Johnny Hunter, cofounder of L.E.A.R.N. “My uncle didn’t live to experience the horrors of legal abortion, which includes death to babies and harm to women. Today he would have fought just as hard to secure the rights of unborn Americans as he fought for racial justice for Blacks. “Americans and all people are not racially divided biologically or spiritually, but are rather ‘one blood/one race.’ [Acts 17:26] At CRU we seek to end abortion genocide and educate and unite the human family around the sanctity of life. “We can reflect our support for life by praying, participating in the prolife movement, and voting prolife,” King urged.